Mothernode CRM lets ConstructConnect customers conveniently receive or import information from their ConstructConnect Account into their leads and opportunities. You must be a ConstructConnect Insight Customer in order to use these features. For more information about ConstructConnect and their plans, contact a ConstructConnect representative. For instructions on how to export project leads from ConstructConnect Insight, please read the article Exporting Project Leads from ConstructConnect. ConstructConnect Insight Customers whose subscription includes the API service will get the most benefit with their Mothernode Integration. Once you’ve established your daily search criteria in your Insight Account (contact your ConstructConnect rep for details) your projects will post daily into you Mothernode Account. 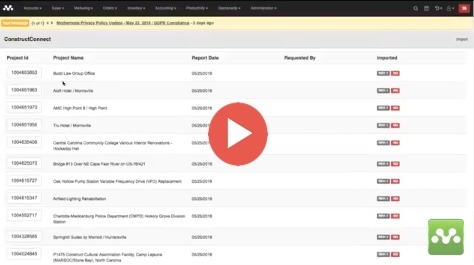 This option includes the maximum amount of project information available from ConstructConnect’s Insight product. Some of this setup will require information from your ConstructConnect account rep.
ConstructConnect Insight Customers can export their project data manually and import the XLS files into Mothernode by using a simple drag and drop feature to drag the exported file onto the import dialogue window. This process is best when using unscheduled importing. For more information on how to export your data from your ConstructConnect account, contact your ConstructConnect Account Representative. 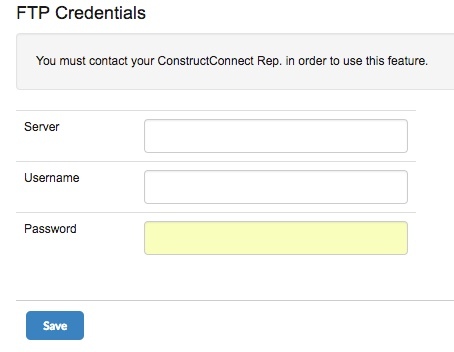 ConstructConnect Insight Customers who receive daily reports of their projects via email can forward these emails, along with the XLS attachment to their Mothernode CRM account. This process will automatically update the Mothernode projects list in the Leads and Opportunities with the new or revised projects from the XLS attachment in the email. Administrators can find their ConstructConnect email address in the API Settings Tab. IMPORTANT: When emailing daily ConstructConnect Projects to Mothernode CRM the sender’s email address must match the same syntax as their user account. Otherwise, Mothernode CRM will not accept the email. This is a security feature. Administrators who want to activate their ConstructConnect account in Mothernode can do this following these steps. This process is required for all Options above. Check the box Enable Construct Connect and click Save. Once you enable your ConstructConnect Settings you will see the ConstructConnect Button in the Leads and Opportunities Module. This button will let you access the inbound projects screen.